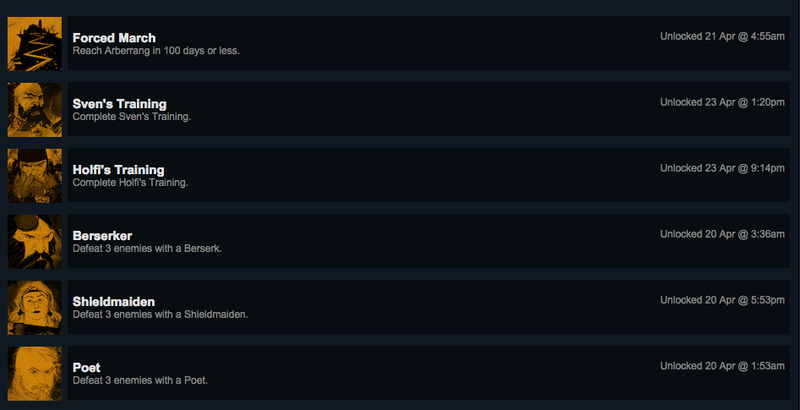 The Banner Saga 2 is a Steam game at heart, so, y'know, achievements. They were bound to happen. That said, there's an extra bonus to getting achievements in The Banner Saga 2, as you earn Renown for your current party as well as get a fancy trophy for your Steam account. Worth doing, for certain. 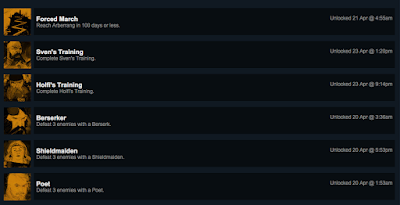 I'm not 100% on all of these achievements yet. I'll continue to update this list with tips as I snag 'em all. Forced March: Reach Arberrang in less than one hundred days. So long as your characters don't get knocked out too often you can make this happen. Sven's Training: Complete all of Sven's training challenges in chapters eight, ten, and twelve. Holfi's Training: Complete all of Holfi's training challenges in chapters nine, eleven, and thirteen. Berserker: Defeat three enemies with Bolverk. Shieldmaiden: Defeat three enemies with Folka. Poet: Defeat three enemies with Aleo. Cantref: Defeat three enemies with Derdriu. Teulu: Defeat three enemies with Scathach or Ro'Ech. Axe Thrower: Defeat three enemies with Oli. Wanderer: Defeat three enemies with Sparr. Slaughterer: Defeat three enemies with Bak. Tracker: Defeat three enemies with Dytch. Normal Difficulty: Complete The Banner Saga 2 on Normal difficulty. Rook's Journey: Meet King Meinolf (basically complete the game) with Rook. Alette's Journey: Meet King Meinolf (basically complete the game) with Alette. 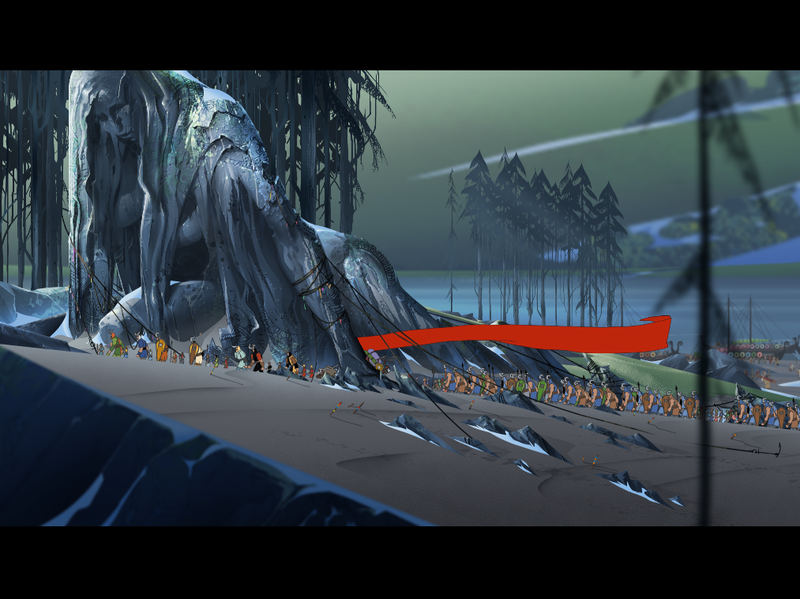 The Saga Continues: Import a saved game file from The Banner Saga. Sundr Slayer: Kill Eyeless in the final battle of chapter thirteen. You can't end the battle when you have the option. Treasure Hunter: Acquire three rank ten items. Either you'll have to buy 'em or hope you find 'em. Master Tactician: Complete a Hard difficulty sparring battle in the Training tent with six rank ten units. These do not include the challenges. Can be tricky, and I find this easier to complete on a default game where you have fewer units - and, thus, less temptation to spread the Renown around. Against the Odds: Win Rook's solo battle against the dredge in Chapter Eight. Not easy, though staying at a range and slowly, slowly whittling enemies down makes it possible. Easier if you're importing a Rook with a good item attached. Culling Frenzy: Kill five enemies in one turn with Bolverk's Cull the Weak move. Easier to complete if you're fighting low-Armor enemies and a full War Horn. Sneaky: Kill five enemies with Eirik or Dytch's Track ability. Alliance of Convenience: Satisfy Rugga, in essence. Don't take on extra people in Chapter Eight, don't split your forces during the battle in Lundar in Chapter Ten, and save Ettingbekr in Chapter Twelve. Rugga will congratulate you at the beginning of Chapter Fourteen, and you'll earn the achievement. Demolition: Break thirty barricades in a single playthrough. Not difficult, though you'll have to go out of your way in a few battles to get them all. Zefr: Kill three enemies with Zefr. Let other people weaken the baddies first. War Bear: Kill three enemies with Spinegrinder, Eirik's War Bear. You need to have Eirik in your party to make this happen, as well as tread on sacred ground in Chapter Twelve and use Eirik's Capture Bear ability. Hard Difficulty: Complete the game on Hard difficulty. Challenge: Complete the game on Hard difficulty without losing a single battle. Quartermaster: Complete the game without having a single death from starvation. Basically you need to have enough Supplies to feed the caravan throughout. High Spirits: Complete the game without ever dipping into low Morale. Resting often is compulsory, as is making the right event choices. Fighting Force: Have an army of 600 or more Fighters. Training will be necessary. Intense Repossession: Watch Eyeless possess ten fallen units. You'll need to let her live for a while to catch her doing this. Varl Dregs: Reach Oldford with 20 or more Varl following Bolverk. Having Krumr in your party in Chapter Thirteen will make this easier. Keep Your Wits: Bolverk must act as others would expect. He basically needs to always be an insensitive jerk. Any blatantly sympathetic or 'good' acts - offering to help others, expressing concern, things like that - must be avoided. I can confirm 'Against the Odds' acheivment requirement - Defeat all the Dredge with Rook at the start of chapter 8. Requires planning your moves/attacks/rests around the enemy movements, keeping out of range while you gradually whittle them down. Cool, thanks. Edited. I'll have to try it again a few times, see if I can survive. Sneaky is to kill while hiding. Does not require Dytch (can be combined with Eirik at level 6). BTW the hiding ability is *very* useful as a tank. Enemies will walk into hiding character and lose their turn. Esp useful with Eirik as he can use his rally to generate willpower while cloaked. Right, right, I forgot Eirik can use that too. Thanks! Nice :D You're welcome, great job on the walkthrough! I got "Break through" for destroying all of the barricades in the first village encountered by Bolverk. My counter said that by that time I had destroyed 23 barricades (I was working in the demolition achievement. There is also an achievement (Assert Dominance, +10 Renown) for not getting any units knocked out during Chapter 9's fight with Mogun.